*Tax rates presented are an estimation based upon the previous year’s tax rates and/or third party information and are provided as a courtesy without representation or warranty of any kind (expressed or implied) for completeness, accuracy or all other purposes. We recommend contacting the local taxing authority for the most recent and/or up to date information. For City Park Tax information please visit here. HOA: City Park South Homeowner’s Association, Inc.
Management Company: Planned Community Management, Inc.
City Park Homeowners Association and City Oaks (City Park South HOA) are separate entities. For City Park HOA information please visit here. Trash Pickup is regulated by the City of Houston. Contact and pickup information is TBD. The Houston Museum District consists of 20 museums within a 1.5 mile radius of the Mecom Fountain. The Houston Museum District Association is dedicated to collaborative efforts that maximize use of the artistic, scientific and educational resources. The Houston Zoo is a 55-acre (22 ha) zoological park located within Hermann Park in Houston, Texas, United States. The Zoo houses over 6,000 animals as a part of over 900 species housed. Miller Outdoor Theatre in Hermann Park is Houston’s venue for free performances. The Pearland Town Center is an our door mall with many different shops, restaurants and department stores. Wildcat Golf Course is like no other golf experience in the Southeast Texas area. The preferred golf club feature elevations up to 100 feet providing spectacular views of Houston’s downtown skyline, the Galleria and the Reliant Stadium complex. Wildcat combines links layouts with Texas Hill Country topography, Houston Hospitality and fun! The Houston Sports Park has 5 Bermuda grass fields and 1 FieldTurf™ field that can accommodate practices, league play, camps and tournaments in an ideal location free from traffic or industrial distractions. Other park amenities include HEB water playground feature, parking for up to 300 vehicles, and a green space area. HSP is home to the Houston Methodist Center for Sports Medicine and a Competitive Edge Sports Performance training facility. The Tom Bass Regional Park is a great local park area for your family’s enjoyment. The regional park has a community center, multiple pavilions with picnic areas, tennis courts, volleyball courts, nature trails, two golf courses, play grounds, community gardens, performing arts pavilion, lakes, fishing, and two dog parks. Texas Medical Center (TMC) is the world’s largest medical complex. Today, TMC comprises: 21 renowned hospitals, 13 support organizations, eight academic and research institutions, six nursing programs, three public health organizations, three medical schools, two universities, two pharmacy schools, and a dental school. CITY PARK SOUTH HOMEOWNERS ASSOCIATION INC. (“HOA”) HAS PREPARED THIS COURTESY NOTICE OF SUMMARY INFORMATION TO ENCOURAGE THOSE INTERESTED IN THE CITY PARK COMMUNITIES OF CITY OAKS TO BECOME FAMILIAR WITH IMPORTANT AND/OR HELPFUL INFORMATION ABOUT THE COMMUNITY AND/OR THE SURROUNDING AREA. THE CITY PARK COMMUNITIES, CITY PARK AND CITY OAKS, IS GOVERNED BY TWO SEPARATE HOA’S THAT ARE NOT AFFILIATED. CITY PARK IS GOVERNED BY CITY PARK HOMEOWNERS ASSOCIATION INC (“HOA”). CITY OAKS IS GOVERNED BY CITY PARK SOUTH HOMEOWNERS ASSOCIATION INC (“HOA”). ADDITIONAL INFORMATION MAY ALSO BE FOUND OR UPDATED PERIODICALLY AT WWW.CITYPARKHOUSTON.COM OR BY CONTACTING THE HOA MANAGEMENT COMPANY. PLEASE TAKE NOTE THAT THIS FRONT YARD MAINTENANCE IS NOT PROVIDED FOR OR PAID BY RESIDENTS IN OTHER CITY PARK COMMUNITIES NEIGHBORHOODS OTHER THAN CITY OAKS. The HOA provides mandatory front yard lawn and landscape maintenance for all homes in City Park South. This service is paid for by each home owner in this neighborhood of City Park South. This amenity is authorized per the Declaration of Annexation and Declaration of Covenants, Conditions and Restrictions for City Park South Section one filed under Harris County Clerk’s File Number (TBD) and amendments there to which apply to this community and it is established by the Board of Directors (“Board”) and subject to renewal for the following year on an annual basis at the discretion of the Board. The term “Front Yard” as used herein shall include all visible areas of the front and side yard of residences from the street curb to the house or fence. The Front Yard Maintenance program provides significant benefits to each property owner and to the City Park South neighborhood as a whole. Some of these benefits include: uniformity of maintenance both in style and appearance as well as the schedule by which all residential properties are maintained, increased street appeal and convenience to the property owner. The Front Yard Maintenance program will be administered by the HOA, through their managing agent, Planned Community Management Inc. The maintenance services for the current year will be provided by Westco, a full service landscape management firm that will also be maintaining the community’s common areas for the HOA in the current year. Please take note that this service is not provided for or paid by residents in other City Park neighborhoods other than City Park South. Front Yard maintenance includes mowing, edging, weed control and fertilization of the lawn area on a schedule of 42 trips a year. Backyard maintenance service is not provided and will remain the responsibility of the Owner. Front Yard landscape maintenance shall include monthly trimming of the landscaping (excluding trees), monthly bed area weeding, and one mulch application per year. Any landscape, irrigation, lawn and bed materials that require replacement will be the responsibility of the Owner. 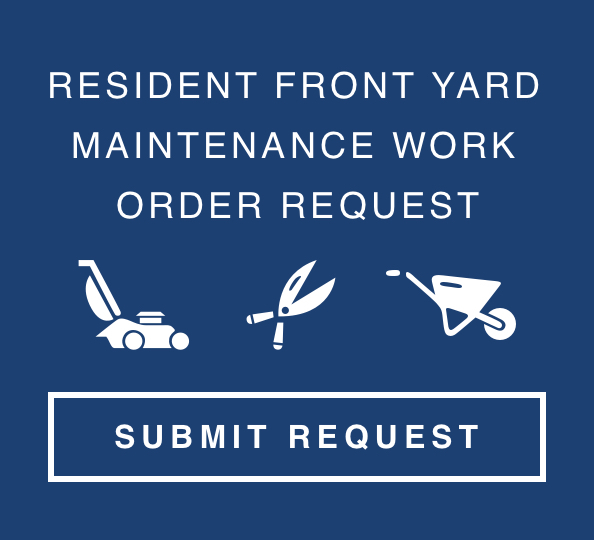 The HOA has been granted an easement across all lots under the deed restrictions to perform Front Yard Maintenance. Owners will be billed in advance on an annual basis for the Front Yard Maintenance program. The 2015 annual cost is $TBD per lot. HOA Front Yard maintenance will generally take place on Thursdays from 7:30 am to 7:30 pm (weather permitting). Friday is a back-up day for inclement weather and schedule adjustments. While these days are the planned days, if weather is a problem, alternate maintenance days may be necessary. Keep all vehicles, toys, potted plants, water hoses, pets and other objects away from Front Yard Maintenance areas and/or in the garage. Any damage which may occur to these items is the responsibility of the Owner. Monitor irrigation system so that all areas are not too wet or too dry. The Front Yard Maintenance program does not include maintenance, repairs or adjustments to irrigation systems on individual lots for any reason. The owner is responsible for ensuring that the right amount of water is applied to the front of the residence. Do not water 24 hours before landscape maintenance day to minimize yard damage. Yard equipment rutting can occur from overwatering. Any such damage shall be the responsibility of the Owner. Provide unfettered access to all Front Yard Maintenance areas. Damage to such items as landscape lighting and front yard accessories is the responsibility of the Owner. The Front Yard Maintenance program does not include seasonal flower installation/replacements or removal of dead trees and shrubs. Owner shall be responsible for all seasonal flower installation/replacements and all timely removal and replacement of dead trees and shrubs. Report any problems immediately to the HOA management company. The Front Yard Maintenance Program does not include tree trimming or tree replacement. Owner shall be responsible for all tree trimming and replacement. Backyard service is not provided and will remain the responsibility of the Owner. THIS IS A COURTESY NOTICE AND MAY NOT CONTAIN ALL INFORMATION OR INCOMPLETE INFORMATION ABOUT THE FRONT YARD MAINTENANCE PROGRAM. THE PROVISIONS OF THE RESTRICTIONS (AS EACH MAY BE AMENDED) AND THE DECISIONS, POLICIES, ACTIONS (AS SUCH MAY BE MODIFIED) BY THE HOA BOARD OF DIRECTORS AND THE HOA MANAGEMENT COMPANY (INCLUDING YARD MAINTENANCE) SHALL SUPERCEDE ANY INFORMATION CONTAINED HEREIN. INFORMATION IS SUBJECT TO CHANGE WITHOUT NOTICE OR REVISION HEREOF. For more information about the Front yard Maintenance Program in the neighborhood of City Oaks, please contact the HOA Community Manager. To report street light outage use the HOA contact information.